There are four big releases coming out this weekend, so I’ll try to keep my thoughts on each of the movies brief, so this article doesn’t become too tedious. The movies are “The Conjuring”, “Red 2”, “R.I.P.D.” and “Turbo”. “The Conjuring” will do superb business this weekend. James Wan’s movies have an average opening of $10.9 million. Supernatural horror movies open at an average $15.26 million, but 2013 horror movies have been outstanding in their opening weekend performances. “Mama” opened to $28.4 million back in January, and “The Purge” opened to $34 million last month. Those movies opened to little to no competition. (“Mama” was up against “Broken City” and “The Last Stand”, two under-performing movies; while “The Purge” was up against the modestly-performing “The Internship”.) This movie opens on a busy weekend, but it is heavily anticipated and it has critics raving. Also, since “The Purge” had such poor word-of-mouth, it plummeted from $16.7 million on the Friday to $10.4 million on the Saturday, a day where movies usually earn more than the Friday. Anyway, horror fanatics haven’t received a horror movie since “The Purge” in June, and they haven’t received a good horror movie since April’s “Evil Dead”. Since it is anticipated, has star power (Vera Farmiga, Patrick Wilson), and since it looks great, I’m going to go high with my prediction. I also think this will have phenomenal word-of-mouth, so this will go strong all weekend. I’m predicting $37.5 million for its opening. “Red 2” is the sequel to 2010’s action comedy hit. It brings back the cast and this one looks really fun. I haven’t seen the first movie, so I’ll be watching the first one sometime this week. The first “Red” opened to $21.76 million back in October 2010, against “Jackass 3-D”, that opened to $50.3 million. “Red” has a good following, though, as it has a standing 7.0 IMDb score based on over 140, 000 user ratings. 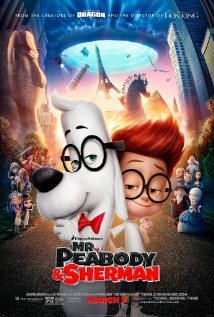 It is also the tenth-best selling DVD of 2011 (sandwiched between “Transformers: Dark of the Moon” and “Despicable Me”). The movie has a great cast including Bruce Willis, Helen Mirren, Anthony Hopkins and Mary-Louise Parker (who is also starring in “R.I.P.D.”).With this film’s good following, I think this sequel will beat its predecessor in its opening weekend number by a decent-sized margin; so for the three-day weekend, I’m predicting this at $25 million. “Turbo” is DreamWorks’ latest production, and I think it’ll do well, as family audiences aren’t yet tired of animated movies. They have emptied their pockets on “Monsters University” and those little yellow minions are still dominating the market, so this could very well suffer from competition of those animated movies, and the other new releases. And families just could wait for “The Smurfs 2”. This seems like DreamWorks’ answer to “Cars” and “Ratatouille” in the way that it’s an underdog story. Kids like racing movies, but are they willing to see a racing movie that has a snail going for gold? Of course, Pixar was able to make a rat appealing in “Ratatouille”, but DreamWorks isn’t nearly as respected as Pixar. (But then again, which animated studio is?) And “Epic” had a snail and a slug as supporting characters, but they were there for comic relief, mostly. Anyway, with a decent-looking underdog story and a good voice cast (Ryan Reynolds, Samuel L. Jackson, Ken Jeong), this should do decent business on a busy weekend. For the three-day, I’ll predict $28.8 million; and for the five-day (Wed-Sun), I’m predicting $43 million. Now that I’ve discussed all the ones I think will do well, this is the one I don’t have a lot of faith in. “R.I.P.D.” looks like fun, but it’s the least appealing out of all of the new releases. The 3D action comedy is adapted from a comic book of the same name, but I don’t see it doing well. Audiences haven’t been showing a lot of enthusiasm for it yet, but I think it’ll still attract a small audience somewhere in the low-teen millions. People like Jeff Bridges and Ryan Reynolds (who’s going to have a busy weekend), but I don’t know if this is on many people’s radars. I think it could do decent business, but it’s going to suffer because of all of the competition. And older action fans will probably just see “Red 2” instead. It’ll break $10 million, I think, but I don’t think it’ll go past the $15 million mark. I’m going to underestimate Bridges and Reynolds’ combined popularity and say an awful $12.8 million. Released: July 3, 2013. Directed by: Pierre Coffin, Chris Renaud. Starring: Steve Carell, Kristen Wiig, Benjamin Bratt. Runtime: 98 min. I don’t remember some of the first movies I’ve ever seen. At least the first one I saw at the theatre… I’ve been trying to remember, but I haven’t come up with the answer yet. I blame my memory and my Mom and Dad’s poor memory. Thanks a lot, parents! (Just kidding. You’re great.) 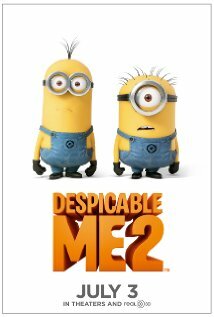 Anyway, my point is, “Despicable Me 2” is a perfect choice for your weekend’s family-friendly entertainment. If your kids haven’t been to the theater to see a movie in their lives yet, even better. It will be a memorable first experience. Just make sure your tyke is five or six years old (as there is one intense-ish scare that could spook your little ones, as a child at the screening I attended, who looked about four years old, started crying; but more on that later), and they’ll have a great time. This film is endearing, charming, fitfully funny and a whole lot of other flattering adjectives. “DM2” is a remarkably well-written tale of a bad guy who isn’t exactly a bad guy any more. Gru (Steve Carell) has hung up most of his awesome gadgets and weapons and he is trying to kickstart a business selling jellies (and maybe jams, but he’s undecided on that). Things begin to go awry when a new super-villain steals a serum that turns innocent little bunny rabbits into crazy purple beasts who will eat anything in their path. The Anti-Villain League, led by Silas Ramsbottom (Steve Coogan), recruits Gru to take down this super-villain, because he thinks like one. Gru and super agent Lucy Wilde (Kristen Wiig) go undercover to take down the baddies, and hit things off in the process. “DM2” struggles to repeat the magic of its predecessor in some aspects (with its antagonist), while it improves on it in others (with its elevated slapstick humour). The new villain is inferior to Vector of the first movie, but he produces a few laughs. He also receives an appealing back-story, and he’s particularly evil. He just isn’t the most amazing villain you’ll ever see, but the voicework enlivens him a bit. I won’t say the name of the villain, because the marketing campaign has done a good job at keeping the villain a secret from the movie-going public; but anyone over the age of five or six, will be able to see who the villain is before the “reveal”. The antagonist may be the movie’s weakest aspect, but it is strong in so many other ways. It has great heart, appealing themes of family and love, and well-written characters. Carell truly brings it again as Gru, and the character is given new layers as he struggles with over-protective fatherly instincts over his eldest daughter, Margo (Miranda Cosgrove), who is attracted to Antonio (Moises Arias), the son of a restaurant owner, Eduardo (Benjamin Bratt), who is suspected of stealing the serum. Gru’s mission also gets blinded by his growing attraction to Lucy. You’ll fall in love with Gru all over again, even if he isn’t yet above blasting someone with his trusty freeze ray. The unicorn-loving Agnes (Elsie Kate Fisher), the youngest daughter, is growing up very well, but she still maintains all of her signature cuteness. She also seems to be more mature than the middle child, Edith (Dana Gaier), who never feels more than a petite supporting role. Eduardo is amusing, but he is practically every Mexican stereotype shoved into one character. Kristen Wiig is just being herself to great effect as Lucy Wilde, an improvement over the cruel Miss Hattie (Wiig’s character in the first movie). Thankfully, this super agent isn’t super annoying; she turns out to be an endearing presence, and one can easily open up to her cuckoo for cocoa puffs kinda personality. And of course, there are the minions. They are as funny as ever with just the right amount of screen presence. They will help you watch this with a gleeful smile on your face, as they deal out slapstick humour, talk in their made-up gibberish language of Minion-ese, and sing renditions of All 4 One’s “I Swear” and Village People’s “YMCA”. (It’s seriously laugh-out-loud hilarious; and you won’t be able to stop laughing when you hear these songs in the future.) 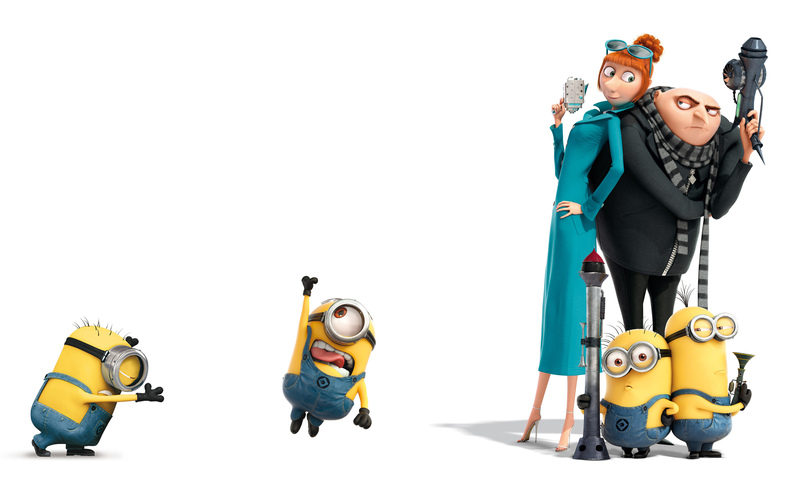 All of these characters help enrich 2013’s funniest animated film. I think animated movies have quite a magic about them. They make me feel like a kid again (even though I just turned eighteen in December), but I still do view them with a mature eye. 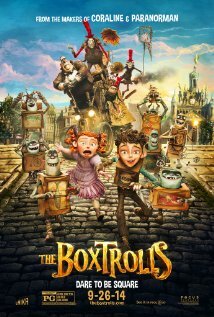 I see this movie as both an animated movie with lots of endearing characters and kiddish humour the little tykes will enjoy; but I also see it as a great family film with some AWESOME super-hero/super-villain action sequences and some hysterical slapstick humour, that adults will enjoy. They won’t feel the need to steal their kids’ Twizzlers and use it to strangle themselves. Some scenes in animated movies are intense nowadays, at least for kids. “Monsters University” even has a sequence that plays out like an ode to horror movies. This film has an intense scene that could spook the hell out of kids. (So, please don’t bring any kids under the age of four or five, in case it makes them cry. In which case, it will make the 18-year-old film critic sitting in the fourth row want to knock someone the f*ck out.) All of these somewhat intense scenes have me thinking some studio should make an animated horror flick. (Oh please! It worked well with 2006’s “Monster House”…) Now that will give more adults something to feast on. “Despicable Me 2” has a great atmosphere and it’s rivaled by its predecessor and Pixar’s “The Incredibles” as best animated super hero (super villain?) movie. This is the hardest I’ve fallen in love with an animated universe, that wasn’t created by Pixar. This might not make you bawl like a Pixar movie, but it will warm your heart a heck of a lot. It’s sure to entertain and make you laugh, if you have a measurable sense of humour. This movie brings a huge smile to my face, and I hope it has that effect on you. This original movie doesn’t have to be as good as “The Incredibles” or any other Pixar movie really, because this isn’t Pixar. This is Illumination Entertainment. They have created a movie with an amazing attention to detail (like making so many minions different, and even making one minion that looks a lot like Samuel L. Jackson as Jules in “Pulp Fiction”), and a spectacular universe. The music chosen by Pharrell Williams is quite possibly better this time around. I love this studio making movies, because they’re entertaining, charming and heartfelt. Illumination Entertainment is here to stay. Despicable Me is one of those universally loved movies. It’s charming, entertaining, heartfelt, and hilarious. Since Monsters University showed that families are willing to spend good amounts of money on animated flicks, Despicable Me 2 is in great condition. And, families might have held out on that – to wait for this. Movies similar to this open to $42.52 million. 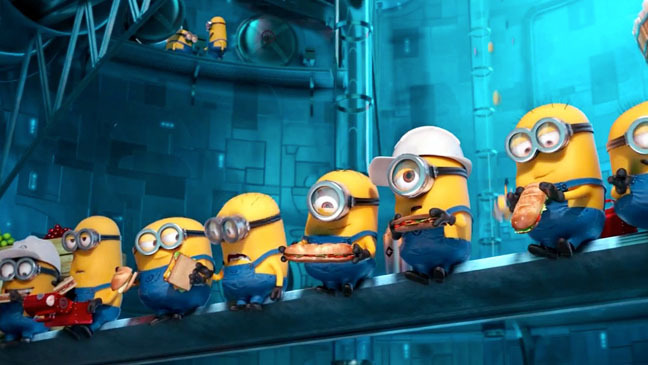 Despicable Me opened to $56.39 million. There is only three years between the original and this sequel, and that’s great in the animated realm – considering the movies take so long to make. 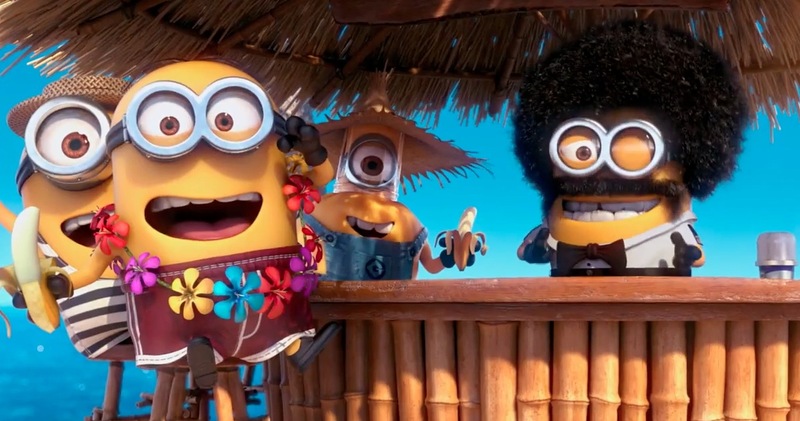 (And there’s a Minions movie coming out December 2014! Woo-hoo! I love those little guys. It’s funny to think that they weren’t made into big henchmen because the studio didn’t have enough funding.) This is one of my most anticipated movies of the year – if not the most anticipated – so to say I’m excited would be an understatement. DM2 has scheduling to its advantage, because Monsters University came out 12 days ago, and that’s almost its only main competition. There’s also the PG-13 rated The Lone Ranger for family audiences and Western movies fans – but I’m not sure how many families will choose that over this. While I don’t think this will exactly manage $100 million in its first 5-day frame, I think it will get close to it; so I’m predicting a $98.3 million opening. 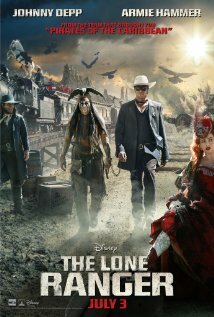 The other main film debuting this weekend is The Lone Ranger, a Western starring Johnny Depp as Tonto and Armie Hammer as the Lone Ranger; and it is from the creators and director of Pirates of the Caribbean. I think Johnny Depp will give a very similar performance to that of Cap’n Jack Sparrow – but it’ll still be entertaining, nonetheless. I don’t have many expectations for the movie – so hopefully it’ll surprise me. And hopefully it’s decent, too, because the last Pirates disappointed the hell outta me. Movies similar to this open to $43.27 million. I think the scheduling will really screw this up, though. I think this could be a decent money-maker, but the reported $250-million budget is a bit insane. And whoever thought Disney would ever earn that money back is very insane. It doesn’t seem to use a whole lot of CGI, so a good chunk of that must went to Johnny Depp and director Gore Verbinski. Anyway, I’m predicting $51.7 million for its first five-day frame. I think it’s more than likely Disney will be crying about this one for awhile. Tagline: From the creators of Despicable Me. In the walled city of Thneed-Ville, where everything is artificial and good air costs money, a 12-year old boy named Ted (Zac Efron) wants to find a tree, so he could win the heart of the much older Audrey (Taylor Swift). When he learns of trees outside of his city, he sets out to find the Once-ler. When the Once-ler tells him the story of his unfortunate greed for money, Ted gets it in his mind that he’s going to reverse it. The mayor of the town, Mr. O’Hare, is one of the only forces that stand in his way. One can tell that this is obviously by the creators of Despicable Me, because of the adorable bears and fish and such characters that have very similar voices to those of the minions. Also, Mr. O’Hare is about one foot tall, so he may be just a little smaller than those minions. Did the production company not have enough money to make him tall? It’s just a little silly. The message it’s trying to teach kids is, don’t be greedy. If you’re greedy, it will only lead to bad things. Protect the environment. Speaking of the environment, it really does have a strong expression of saying, protect the environment. The film is not only trying to get this message across to children, but to adults, too. There isn’t a lot of content to carry this film. It’s one Dr. Seuss story that should have remained untouched. The character of Ted is okay, one can understand his motivations, but he isn’t particularly interesting, and he certainly isn’t lead boy material. The only interesting character of modern-day Thneed-Ville is Grammy Norma, voiced by the energetic Betty White. She is the heart of present day Thneed-Ville. The character of Mr. O’Hare is not interesting, nor is his plot line. Who likes a story of a greedy little one foot-tall man selling air? Not I, because this is simply one of the most uninteresting things I have heard of. This all being said, when the Lorax, the much younger Once-ler, and those singing fish and those absolutely adorable bears, are not present, the film really does suffer. They are the emotional heart of the film. There’s a reason this film is not called Ted and Audrey, or Mr. O’Hare’s a Greedy and Creepy Dwarf. The Once-ler really isn’t generally a greedy man, it was mostly his family that brainwashed him. They reminded me of that family of Hilary Swank’s character from Million Dollar Baby, because when he was out of trees and couldn’t make any more thneeds, they just threw him to the dust and disowned him. Most of these actors proved that they are not cut out for doing voices for animation. Taylor Swift and Zac Efron, especially. I didn’t see any hint of them altering their voices to make their characters sound more fun. Rob Riggle was just okay as Mr. O’Hare, but he wasn’t very memorable. Danny DeVito and Ed Helms were actually pretty good at doing voicework, and they were quite hysterical. Though, the really only stand-out and memorable voice of the bunch is the lovable Betty White. 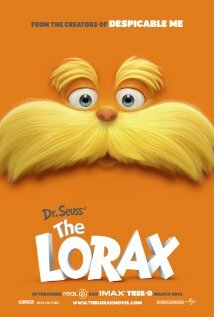 The Lorax doesn’t home enough interesting characters or a particularly interesting story to make this flow well and go through the motions in an impressive way. The animation is quite nice, and the messages that it wants to teach children are just okay. The Lorax doesn’t offer anything very impressive, and it won’t stand out in the running of the Oscars’ Best Animated Feature.